Anyone else looking for some easy and yummy breakfast recipes? I’m all about BREAKFAST options that work for me and my family. 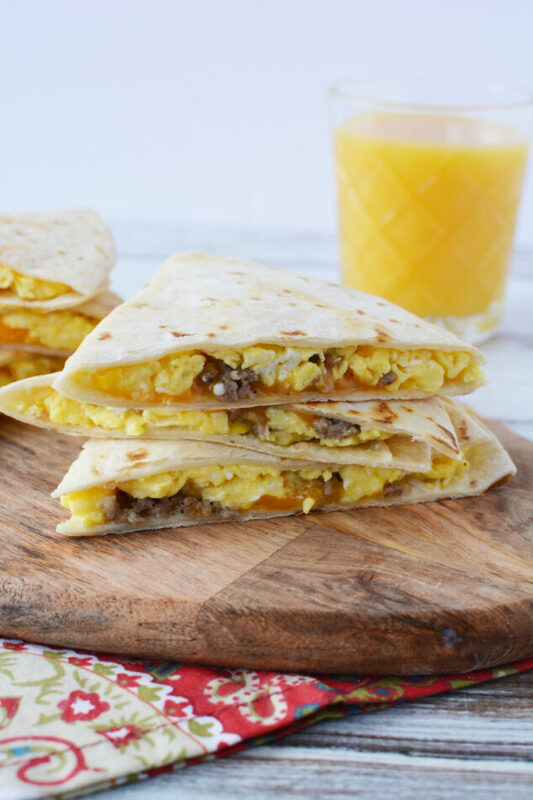 With 4 growing sons that eat a lot of food, I’m always trying to “up” my breakfast game and this breakfast quesadilla answers the bill for me! I want to make sure I’m giving them items that they love and (most important) that are hearty. The toughest thing is when I feed them and then they turn around an hour later and say, “Mom! 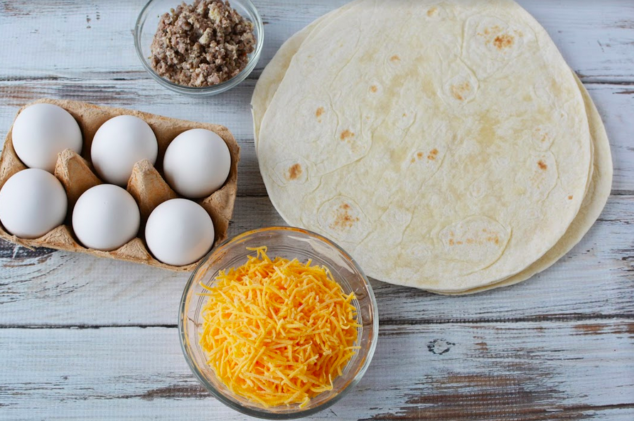 I’m still hungry!” So – the second I learned about this Breakfast Quesadilla recipe – I knew it was going to be a McClelland Family fave! The second you take a bite – you will be in food heaven or a food coma! It’s that kinda amazing. I’m someone who is really very boring in the kitchen when it comes to breakfast. I’ll do pancakes. I’ll do scrambled eggs. I’ll do bacon. I’ll do muffins. Beyond that? I just don’t usually go! I appreciate this because it’s different and unique and creative and it’s something I know my entire family will eat! 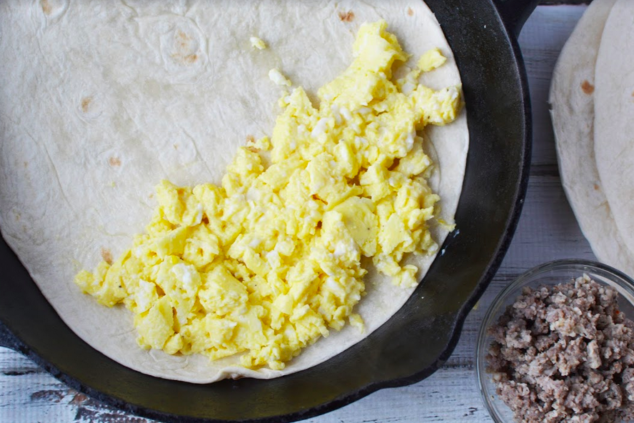 I can also tweak and make each breakfast quesadilla a little different. I love this so much about the recipe! 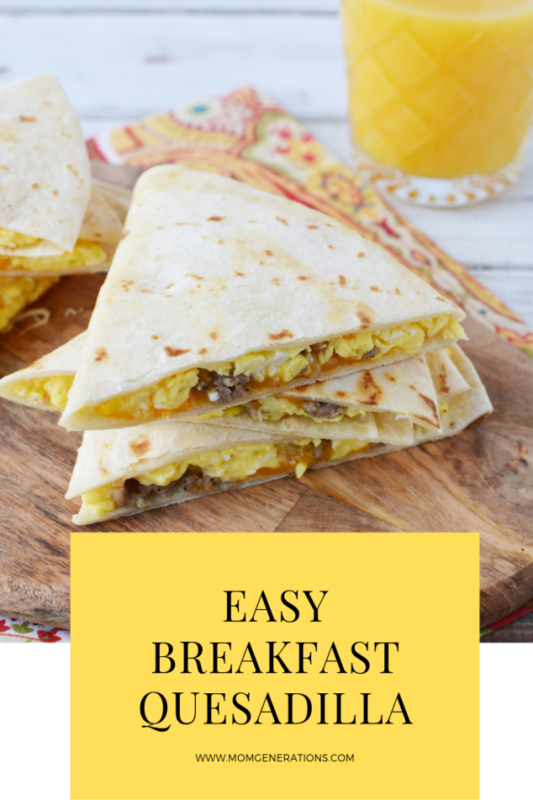 I’m excited to walk you through the entire process to make these yummy and easy breakfast quesadillas! You want to make sure you save this recipe or red flag this blog post because you’ll want to make these again and again and again. 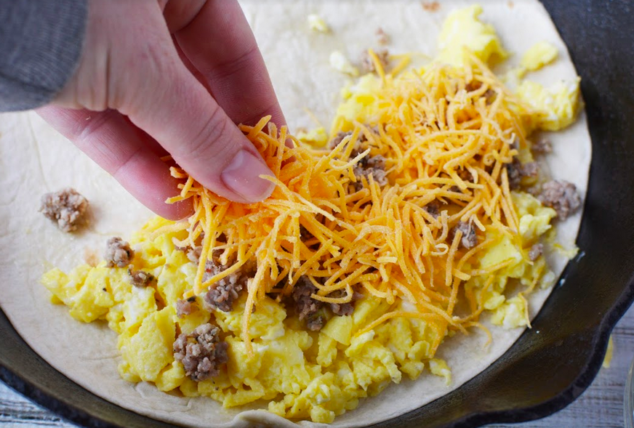 Are you ready for some breakfast magic to happen? Let’s start it off with the beginning. You need to know what you need for this recipe, right!? Ingredients are the way to start! I’m going to go through everything that you need for this specific recipe and REMEMBER if you want to switch it up or swap out different items, just make sure you stick to the recipe, too! I know my kids love ham, so I could easily add that item in as an option, too! Next up! How to actually make these bad boys! I promise it’s not as difficult as you think! I know my 14 year old could easily make these if (and when) I let him! I know my William would eat these as a snack, too! Not just as a breakfast food. They are so hearty they really could be eaten any time of the day! 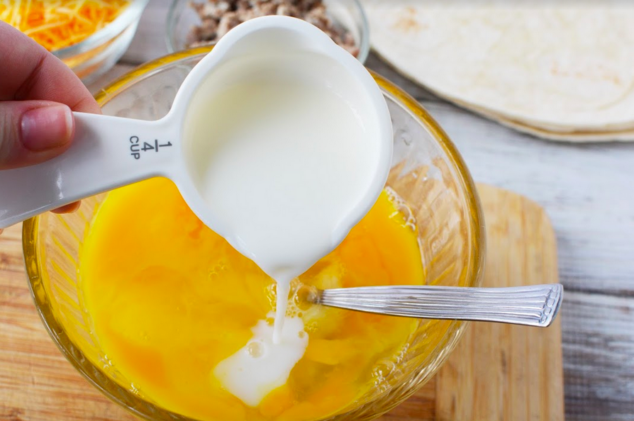 Add eggs and milk together in a skillet and whisk well. 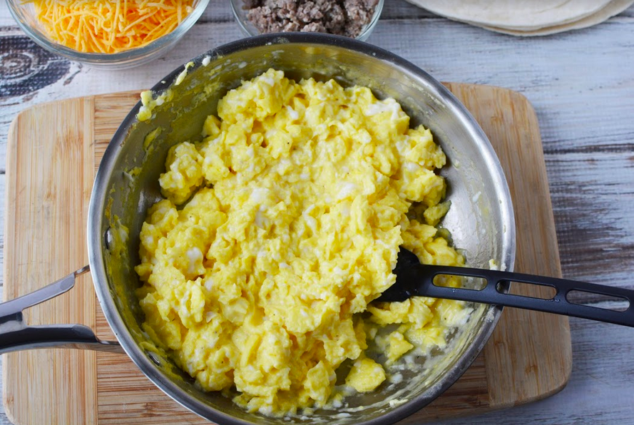 Cook on medium high making scrambled eggs. Season with salt and pepper and remove from heat. 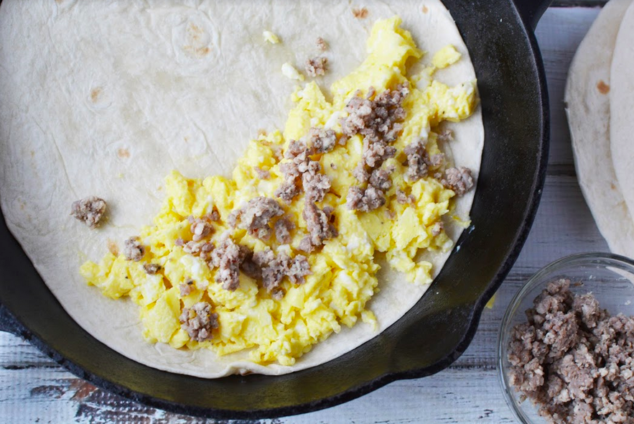 Place tortilla into a large skillet and add 1/3 of the egg mixture. Top with 1/3 of the cheese and sausage if using. 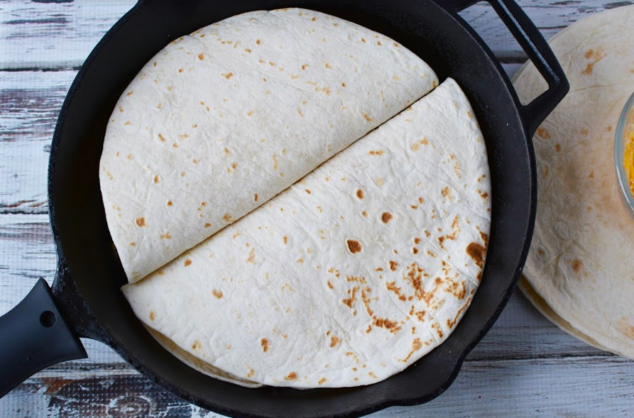 Fold tortilla in half and repeat, so you have another quesadilla on the opposite side. Heat over medium heat, until bottom of tortilla begins to brown. Flip over and heat until the other side is browned. Remove from heat and cut each into 3 triangles. Make triangles and you’re good to go! Talk about a hearty breakfast!! It’s just everything and I love it so much!! I appreciate the fact that this recipe is just so doable and practical. And I’m telling you right now – I love that it’s just a great option for ANY meal. Don’t just get stuck in the breakfast zone. Really think outside of the food box here! Think about how you can easily make it into something that’s a snack before activities. You can roll them into foil to keep them warm and hot!! Here’s my requirements when I’m trying to decide what to make my family for any meal, at anytime of the day! 2. Something that you can eat over and over. 3. Something that you can switch up and add in different ingredients. My kids also don’t want to eat breakfast every morning, which kills me because I know it’s important for them to eat. I like to make sure they’re getting good food in their bodies. I always hate when they go off not eating enough or not eating at all! 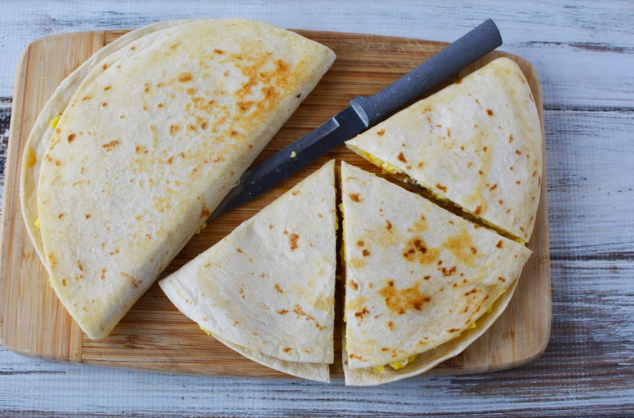 With these quesadillas – I feel like everyone wins because everyone gets something that they want! If you’re a breakfast lover (like me), check out my Cinnamon Bun Recipe, too! You will be salivating on this one! And if you’re looking for some extra fun, head over to my YouTube Channel and check out what we have brewing over there, too! I had to pin this recipe to show my kids so we could make it together. Always looking for quick and easy recipes and this looks so good I cant wait to try it. My kids love different cheeses so will try different ones in them . yum, this looks really good and easy to make! Oooh, these look really good! I love how easy too! Ugh! I wish I could eat egg still (it kills my stomach). 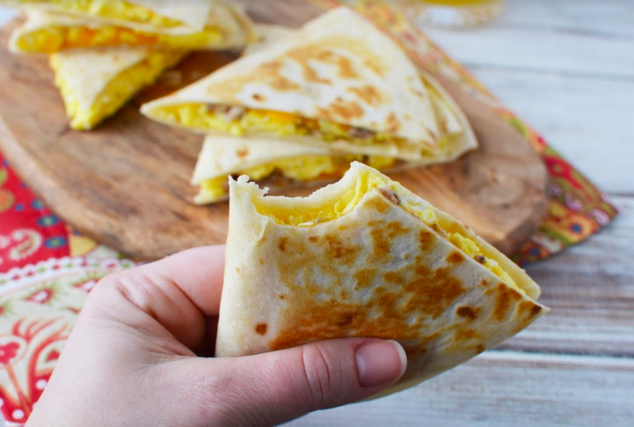 These breakfast quesadilla’s look absolutely delicious and so simple and easy to make! Don’t know why I never thought of this! Thank you! Love all of your recipes. They are simple and good!! This looks so good! Great recipe.